NEC Norwood is home to a new collection of thirty longboxes of bargain comics! Marvel, DC, Image, Dark Horse, and more, ranging from the 1980s to the 2000s! Looking for that one elusive Geoff Johns Teen Titans issue? Trying to patch up the gaps in your Fantastic Four run? Want to flash back to the heady days when Gen13 ruled the Wizard Hot 10 charts? Come have a dig through these new bins, and you won't be disappointed! MAGIC: THE GATHERING AT NEC NORWOOD! 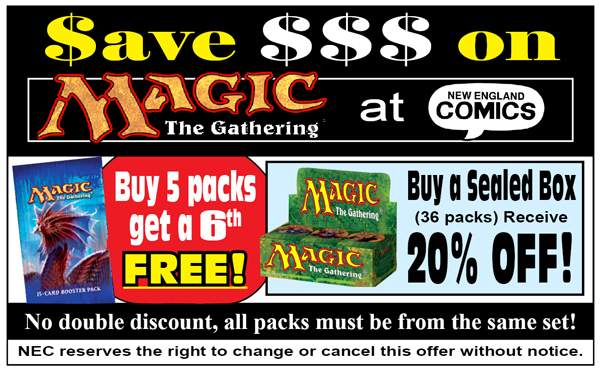 NEC Norwood carries a wide range of Magic the Gathering products and CCG supplies! Our booster packs are the best deal you'll find in the area! We carry event decks, challenge decks, fatpacks, special edition products, and singles ranging from 20 years ago to right now! We also have UltraPro and Dragon Shield deck protectors, deck boxes, binder pages, and everything else you need to take care of your cards! Saturday 5/4: Second chance prerelease or draft, depending on product availability. 1:00. NEW ENGLAND COMICS in downtown Norwood is the perfect location for all types of comics fans. Whether you're curious about the Marvel characters populating your favorite movies, or you're a back issue purist dying to patch those last few holes in your complete set, or you're an explorer of weird indie titles looking for the next big thing, or you're just looking for something fun to entertain the kids with for the drive to Cape Cod... NEC has something for everyone and more! We carry stock from virtually every current publisher, from all of your mainstream favorites, to the small independent books you don't know are your favorites yet. We also carry a hugely diverse selection of graphic novels and trade paperbacks, as well as bagged/boxed sets of comics for people looking for an instant collection! We carry back issues from as far back as the 1960s, a huge section of dollar books, and plenty of kids' comics! We carry toys, apparel, sports and non-sports trading cards, and all kinds of other merchandise besides! Come have a look -- you'll find something cool! 28,000 COMICS FOR $1 OR LESS! On any given day, NEC Norwood has 56 -- fifty-six! -- longboxes of dollar books. That's around 28,000 comics, all for ONE DOLLAR EACH! Marvel, DC, independents, kids' comics, going as far back as 1965 and as recent as six months ago! Got a lazy day and a list of comics you need? Come browse our dollar books! Norwood also has a section of discounted graphic novels, both softcover and hardcover! These books are up to 50% off of cover price, and in the case of pre-owned graphic novels, sometimes even more! The discount GN section has all kinds of titles for readers young and old -- come in and see what a crazy bargain you can get on great reads! WALL BOOKS AND KEY ISSUES! Norwood has a fine selection of affordable Marvel and DC wall books, from Silver Age classics to the hardest-to-find current books and key issues! We just got in a huge collection of Silver Age Marvel books, listed below -- stop by NEC Norwood before someone else gets them first! NEC Norwood DOES buy some comics and collections. Prices depend on not just the books themselves, but also the condition they're in. Please call us at (781) 769-4552 and ask to speak to the manager if you're interested in selling us your comics. We are primarily interested in PRE-1975 Marvel and DC superhero comics, along with some later key issues. (That said, what we need often changes on a week by week basis!) The Norwood location does not buy trading cards, action figures, Beanie Babies, posters, or other collectibles/memorabilia. From 128/95/93-Take exit 15b Route 1 South. Stay on Rt 1 south until the Nahatan Street rotary, you will see a sign saying Norwood center. Take the 1st right off the rotary 'NORWOOD CENTER' This is Nahatan St. Stay on Nahatan until you come to the center of town and take a left onto Washington St. (you will know you are in the center of town when you see a little common with a white gazebo) We are on the left before the five way intersection. Washington Street is also Rte 1A in Norwood. You can also take the commuter rail train service. Take the Franklin/Forge Park line. Get off at the Norwood Central stop. Walk across the street past the Citgo Gas station and continue two blocks up Guild St. to Washington St. and take a right we are about 4 doors down.